Electronics-Salon DIN Rail Mount Screw Terminal Block Adapter Module, For Arduino MEGA-2560 R3. DIN Rail Mount Screw Terminal Block Adapter Module, For Arduino MEGA-2560 R3. 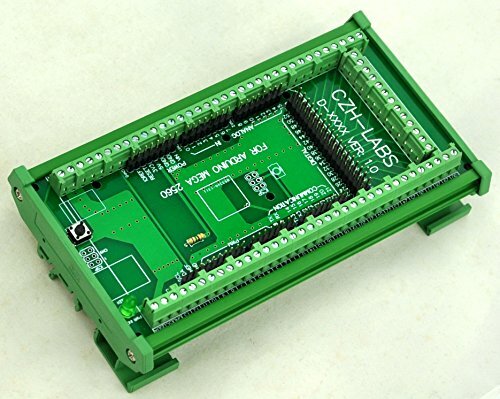 With the adapter module, you can easily extend Arduino projects to industrial control applications. Pitch 3.81mm/0.15" screw terminal block. Terminal block: wire range 26-16AWG, strip length 5mm, Metric M2 slotted screw. FR-4 fiber glass PCB, dual copper layers. PCB Dimensions: 150mm x 72.5mm(W x L). Module Dimensions: 153mm x 87mm x 45mm (W x L x H). Fireproof nylon material DIN rail mount carrier (not China low quality carrier), can support width 35mm / 32mm / 15mm rail, and the carrier can be taken apart for panel mount use. Note: the item not include Arduino-Mage module and iron rail. View More In IO Modules. If you have any questions about this product by Electronics-Salon, contact us by completing and submitting the form below. If you are looking for a specif part number, please include it with your message. Electronics-Salon Pi Screw Terminal Block Breakout Module, for Raspberry Pi.